My first holiday to the island of Puerto Rico, in celebration of my sister’s birthday, was initially planned to be centered around exploring Old San Juan, lounging on the beach, and many a rum cocktail, but as we did a little more research on the island, Puerto Rico’s many excursions and activities began to fill our itinerary. Over the course of our five day vacation we snorkeled, sailed on a catamaran, kayaked the bioluminescent bay one moonless night, and on our final day we trekked through the El Yunque National Rainforest. As the only national rainforest in the United States, the El Yunque rainforest in Puerto Rico is one of the top eco-tourism stops in the country. With over 24 miles of trails for hiking, waterfalls and river-fed pools to swim in, multiple picnic areas, and campgrounds only a short 40 minute drive outside of Old San Juan, El Yunque was an easy choice for our final day in Puerto Rico. The day started with a quick 40 minute drive from Old San Juan at 6 am, through small towns and along the coastline on empty highways to the El Yunque National Rainforest’s gates. A word of caution – for those with a fear of heights, winding mountain roads or drops: you may want to switch out of the driver’s seat before continuing further into the rainforest. The road leading to the parking area is a narrow, switchback road that had me a little nervous with local drivers careening around curves at 50 MPH. I stuck to the posted, much slower speed limits around the curves to ensure that I didn’t get pulled over – apparently a common occurrence on the roads inside of the park – or have a heart attack. The great thing about El Yunque is that there is no fee to visit – you simply drive in and park your car. The only fees associated with visiting El Yunque are a $4.00 fee to visit the Visitor’s Center, ($2.00 for seniors, children 15 and under are free), or the fee for guided nature walks on Wednesdays. The nature walks cost $5.00 per adult, $3.00 for children 12 years and under and $3.00 seniors. The hour and a half walks are offered twice a day, each Wednesday, at 10:30 AM and 1:30 PM, starting at the Palo Colorado Recreation area located on PR-191 at Km. 11.7, and feature talks about the history, flora, and fauna of the rainforest with a park ranger in either Spanish or English, depending on the group. Since we weren’t visiting on a Wednesday, we set out on our own hike through the rainforest. All hiking in the rainforest can be done in one day, though visitors are able to purchase camping permits to explore more trails and beyond the usual waterfall and summit trek. The trails throughout El Yunque are visibly marked and easy to follow, and though at some points they were steep or laid with slippery stone, the trails are manageable for someone with a few hikes under their belt. It is good to note that all hiking and trekking throughout the forest must be done on foot. There are no bike paths and none of the trails are wheelchair accessible. After parking the car, we got our backpacks filled with water, snacks and rain gear out of the trunk and headed to the La Mina Trail first. 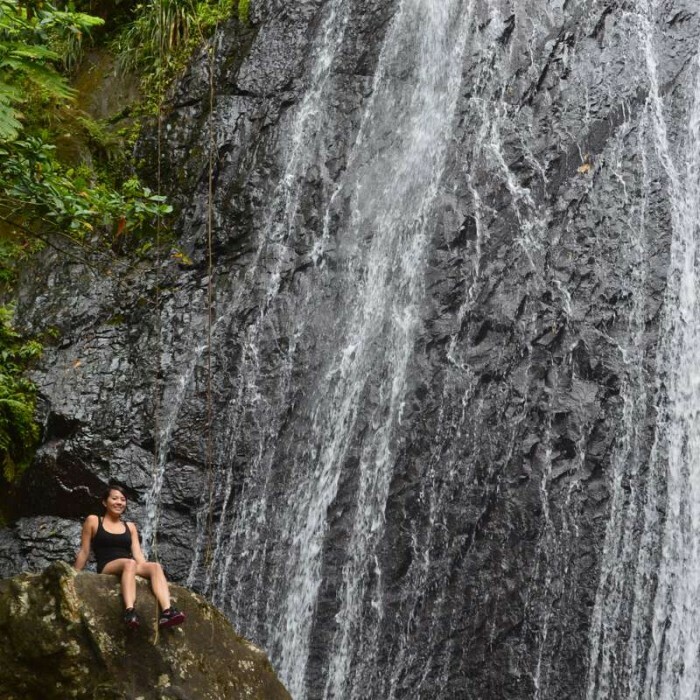 This trail is the most popular and most heavily trafficked of all trails in El Yunque, as it ends at a waterfall and swimming pool (don’t forget your swimsuit! ), so expect to see other hikers along the way. The short, 0.7 mile trail follows the La Mina river through the trees to the Cascada La Mina, or the La Mina waterfall. It took us around 25 minutes to hike to the falls, after which we took a quick dip in the chilly mountain waters and snapped a few pictures under the waterfall before drying off and heading to the Visitor’s Center where our trek to the summit on the El Yunque Trail would begin. The El Yunque Trail begins near the Visitor’s Center and follows the Bano Grande trail to a pool built by the park. After reaching Bano Grande, we took a right and followerd the Caimitillo Trail for a few minutes until we reached the El Yunque Trail split. At the start, the trail is steep, and throughout the hike we walked on both natural pathways and concrete stairs, studded with pebbles for extra grip. The most difficult areas were when the path had eroded away a bit, or the stone steps were slippery from the clouds, morning dew or rain in the forest. All around us, throughout the hike, were the sounds of the forest punctuated by the sound of rain sprinkling on the trees and the babbles of brooks and streams. Apparently you can still see some endangered Puerto Rican parrots throughout the rainforest, but we weren’t lucky enough to spy one on our trek. We did see geckos, hear hundreds of coqui frogs, spied some hibiscus flowers and enjoyed the ever-changing landscape around us during our hike. As you get higher and higher in the rainforest, the trees, fauna and flora change around you from Colorado trees at the start of the trek, to palm trees and more tropical vegetation in the middle of the hike, and finally ending at the Dwarf Forest where the vegetation is usually shorter, shrouded in clouds, and covered in moss. Eventually, we found ourselves on Road 10, a paved roadway that lead to the last steep bit of a climb before we reached the Observation Tower and the summit of the hike. We arrived a bit later in the afternoon than we originally planned, and had some cloud coverage and rain by the time we reached the summit. To ensure clearer views, and for a chance to see clear views of the coast on your hike, it’s best to arrive at the summit before noon. The entire trek, round trip, took us about four hours, since we took some time to take pictures along the way and stopped at the roadside stand, La Muralla, for piña coladas and empanadas before heading back to our car. For the trek, I would recommend wearing light trekking shoes (men, women) and lightweight clothing that is rain repellant, as you could get caught in a shower or two during your hike – this is a rainforest after all! Hiking shorts (men, women) and short sleeved shirts are best for the hike, since humidity tends to be high in the forest. Throughout the hike there are a few rest stops with toilets along the way, but hand sanitizering wipes are always good to pack in your backpack. Bring along a rain poncho for your hike. Snacks, lots of water in water reservoirs, a camera and a portable charger (small, medium and large), a waterproof bag for money and documents, sunscreen for face and body and bug spray are all good additions to your trekking pack for the day hikes, as are a pair of binoculars to take in the sights and animals in the rainforest. For overnight stays at the campgrounds, it’s good to note that all permits must be requested 10 days before you arrive. If you’re feeling a bit more adventurous and have a little extra time after your hike, I would suggest checking out the many zipline opportunities through companies near the rainforest. Most zipline tours and activities take place in the forest surrounding the El Yunque National Rainforest and start in the early morning, usually lasting through mid to early afternoon – leaving you time to explore and hike El Yunque after if you’d like. The treks and hikes through the El Yunque National Rainforest in Puerto Rico are unlike any other hikes you’ll experience within a U.S. park. The variety of trails, with varying levels of difficulty, accented by tropical flora and fauna make this day trip or camping trip well worth a visit the next time you venture to Puerto Rico and decide that the island is so much more than rum and beaches.